What is a Toilet Brush? Toilet brushes can be used to keep toilets clean and sparkling. It is recommended to avoid using a toilet brush to clean other areas of the bathroom after scrubbing the toilet. A toilet brush is an implement used to clean the inside of a toilet bowl, often to improve cleanliness and make a toilet more hygienic to use. This type of brush will usually consist of a long handle with a brush or similar piece of equipment at the end that is used to physically clean the inside of a toilet bowl. There are a number of different types of brushes — some are meant to be used for a long time, while others are designed to incorporate a disposable brushing head. A toilet brush can be found in many homes and businesses and may accompany toilet cleaning liquids or may include such cleaner in the brush itself. In general, a toilet brush is typically used to clean a toilet. While the design of the brush may make it useful for cleaning out other parts of a bathroom, once used on a toilet such a brush should only be used for cleaning toilets afterward. Even though cleaning chemicals are often used during toilet cleaning, the brush itself can still retain bacteria. This is especially true for a toilet brush designed to be used for a long time. This type of toilet brush will usually have a long handle and a brush that is firmly affixed to the end of the handle. The brush will often be rounded and have bristles all the way around it, to make cleaning the inside of a toilet easier. This kind of brush is often used with liquid toilet cleaner to clean a toilet. The cleaner is squirted inside the toilet, and the bottle will often have a bent neck to allow cleaner to be sprayed onto the inner rim of the toilet. Once the cleaner is applied, the toilet brush is used to scrub the inside of the toilet, using the cleaner like a soap or detergent to remove stains and kill bacteria. One of the major drawbacks to this type of toilet brush, however, is that the brush head can often retain bacteria and while stored may spread such bacteria to other areas. Disposable brushes have been designed to cut down on this type of contamination. A disposable toilet brush will consist of a long handle to which a brush can be connected at the end. This brush is often more like a rough sponge and typically has cleaning solution integrated into the brush. After this type of brush is used, the end can be separated and thrown away, so a new end is used each time to avoid spreading bacteria from inside the toilet to other parts of a bathroom. 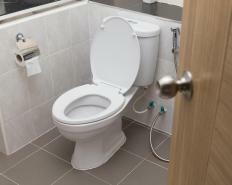 What are the Most Common Toilet Problems? What is a Toilet Plunger? 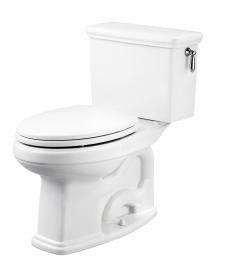 What is an Elongated Toilet? The best toilet brush set I ever bought had a stainless steel toilet brush and toilet brush holder. The brushes themselves were detachable, so I could replace them when they started getting worn out. The angle on the toilet brush was perfect for reaching under the lid, which I didn't realize could get so dirty over time. I was a bachelor for a very long time, so chores like toilet cleaning weren't always automatic for me. Now that I have a wife and two children, I'm more concerned about keeping the bathroom cleaner and more sanitary. I'm usually the first one to pull out the toilet cleaner bottle and a toilet bowl brush now. It's become an obsession, I think. As weird as it sounds, one of the best wedding gifts we got was a toilet brush set. It was something I never even considered buying on my own, but we really needed at the time. It came with a ceramic toilet brush holder and a chrome toilet brush. Most visitors probably don't even notice it, but we don't have to worry about having a dirty toilet bowl brush sitting out in the middle of everything.